Forget, for a moment, the difference between standard, corn-based ethanol and cellulosic ethanol. For this post, all that matters is how ethanol burns, not how it's created. According to new research conducted at Stanford, when an engine burns E85, the byproducts of that combustion are different than when pure gasoline is burned, and not always in a good way. Specifically, the researchers found that E85 creates more aldehydes concentrations - a precursor to ozone - than petroleum gas does. Outside temperature also affect the amount of ozone created, with cold weather resulting in more ozone. Why is this important? The researchers warn that ozone-related health problems could rise with a big increase in using the biofuel, especially in winter. The EPA says that ground-level ozone mostly harms people's lungs and airways. 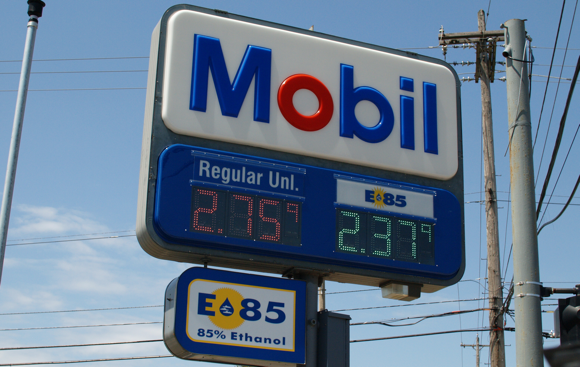 The Stanford researchers were quick to add that their research is preliminary and more needs to be done to understand what might happen if the U.S. moved to widespread E85 adoption. Years ago, a Canadian study found no emissions benefits from using E10. Burning ethanol creates more ozone than gasoline, worse in winter originally appeared on Autoblog Green on Wed, 16 Dec 2009 11:59:00 EST. Please see our terms for use of feeds. 0 comments on "Burning ethanol creates more ozone than gasoline, worse in winter"